Matt Thibodo, 21 is the employee of the month. He works with Mike Ries's franchise out of Fort Collins and Loveland, Colorado. Matt, is single, although the babes are after him. Matt is planning to go to Wyoming Technical University and study Automotive Repair next year. Matt is formerly a star High School Football player on the Championship Team in Ft. Collins, Colorado. He played Rt. Corner. 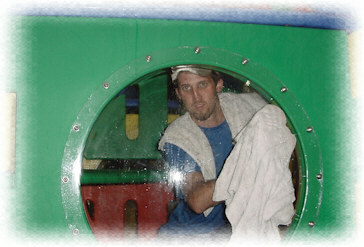 As you can see Matt is helping Mike clean one of the McDonald's Play Places at midnight after a long days work. Matt love the WashGuys and plans to someday have a franchise of his own as well as an automotive repair facility with a Car Wash and a Detail Guys Shop on the property.